Keyboard Shortcut “H” is one of my top 10 shortcut keys. Objects need to be reshaped for all sorts of reasons, perhaps to make a slight adjustment to correct a registration issue or improve the shape of a design element. The Reshape icon is found under the Object Select icon in the Toolbox. 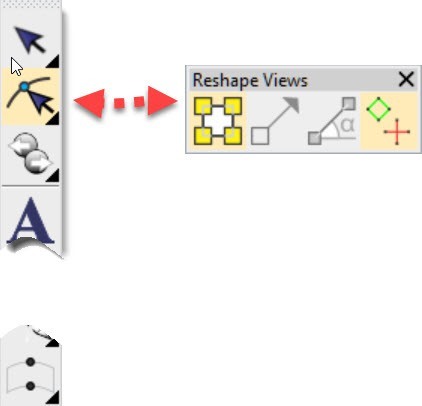 When the Reshape Tool is activated a Reshape Views dialog will appear somewhere on your work space. When the Icon is active there is yellow background highlighting the icon. I need to say, I rarely if ever use these last 3 tools nowadays. Remember the software tools create objects and fill each object’s shape with stitches according to the properties applied to the shape. It is important to understand that when a file is saved as an emb file then only the shape and properties relating to the shape are saved, no actual stitch points, so moving an individual stitch and saving as an emb file the stitch edit will be lost. The only time a stitch edit will be saved is if the file is saved as a machine file e.g. a .dst. The last two icons toggle between leaving the last stitch in an object or removing it. With the closest join feature these icons are now largely irrelevant.